Hey friends, my friend Ken Scott is phenomenal! Seriously the best magician I have ever seen! 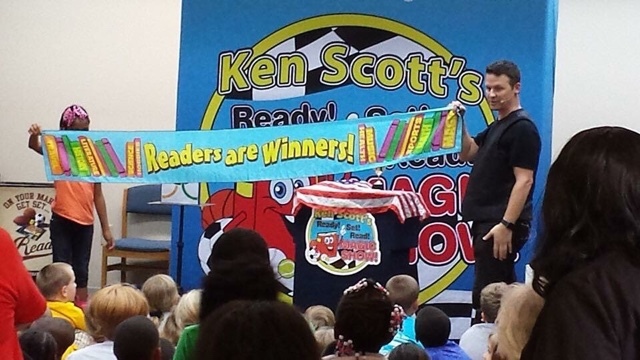 He is the 3-time winner, Atlanta Magician of the Year award, performed 5 times at the White House and more importantly he has performed at the Heneghan home for 5 consecutive Halloween parties entertaining 100's of children. You should come to his show Monday 4 pm at the Dunwoody Library! Check it out! Discussion of City Boards and Committees. 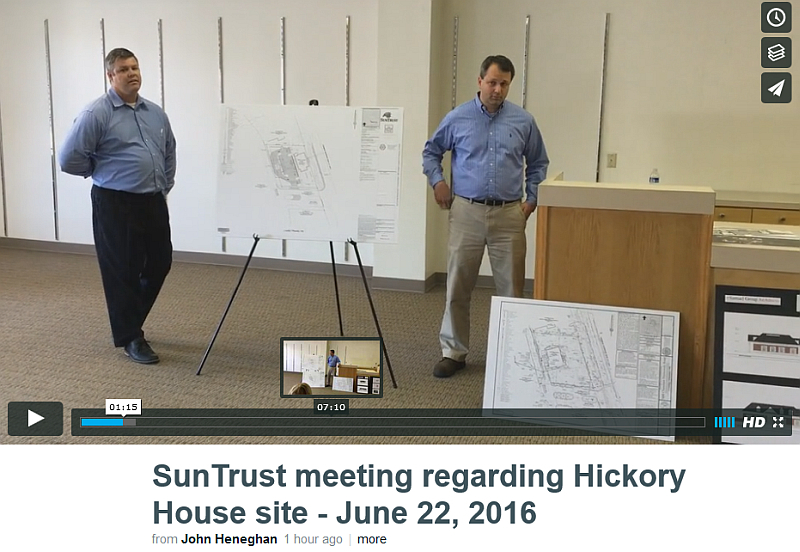 Video of the @SunTrust meeting regarding Hickory House site for a new bank in Dunwoody. I was a few minutes late to this meeting but I was able to record many of the questions and concerns voiced by the about 30 people in the room. 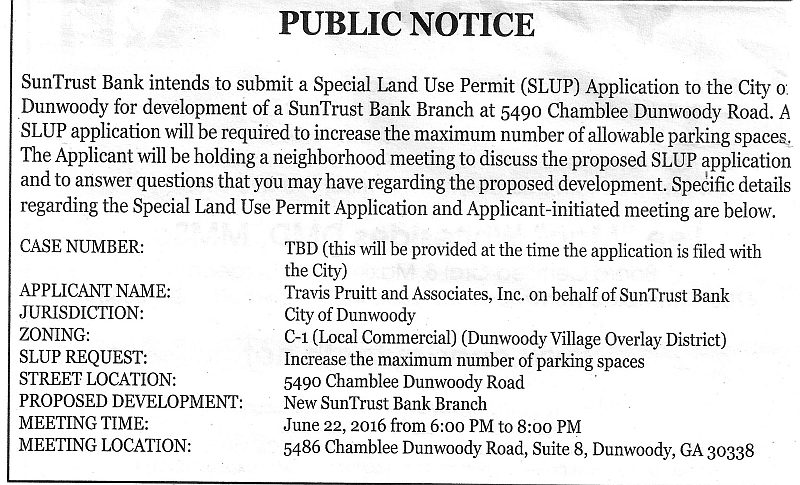 Long story short, SunTrust needs zoning variances for a drive thru and they will go before the Dunwoody Zoning Board of Appeals and then they need a Special Land Use Permit where they will need to go in front of the City Council for approval. Both items should have formal hearings in September where more public comment is available to be made before a final decision is made. PS: thanks for all of the emails I have received from the community on the subject; your feedback is greatly appreciated. Thursday, June 23. is bingo night again in the Social Hall starting at 7:30 PM, doors open at 6:30. 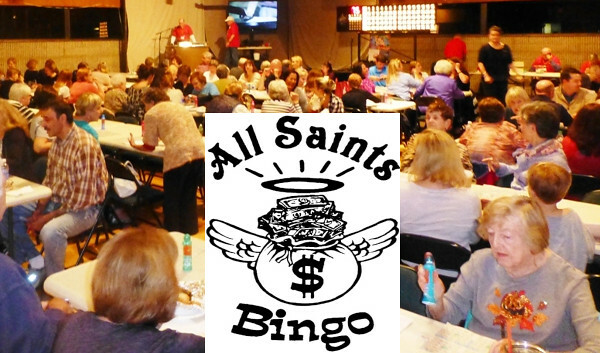 BUT, this Bingo night, The All Saints Youth Ministry will be raffling off a brand new Mercedes-Benz CLA 250. The purpose for this raffle is to help send kids to The World Youth Day, Hosted by Pope Francis, in Krakow, Poland. The Youth Ministry has been selling tickets at our masses at All Saints, and the last two bingos as well. Tickets will be available the night of our May Bingo. The ticket costs are $50 each, or 3 for $100. If more information is needed, please contact the Youth Ministry at All Saints. Come early, reserve your seat and if this is your first time, enjoy "Nonna" Mary's homemade Italian specialties. This month we will probably serve homemade Pasta Fagioli, along with all the other usual amenities. "Nonna" Mary's menu selection is always a hit and as our regulars know everything we serve (except beer and wine) is always very tasty and always COMPLIMENTARY! As you know our BINGO CASH PAYOUTS AMOUNTS have increased. We have been paying out over $1000, and we hope to increase these amounts to the Georgia State max allowable which for now is $1500. In order to do so, our attendance numbers (which are always impressive) need to continue to grow. The price for bingo is still only $15 per player. With this you will get nine cards per game and we play 10 games. That's 90 chances to win! Our 50/50 split the pot raffle, that's held at the end of the evening regularly pays over $125. As a reminder, every dollar over our expenditures, plus our bingo proceeds, goes to our KofC charities, so we do appreciate your donations for the food, desserts, and drinks to cover our costs. Come out and join in an evening of fun, experience the delicious food, all while helping us raise money for charity. First an update - Saturday night there was a change of plans as previously reported as my bride & I celebrated our children being away at camp by going to the restaurant Cowfish Sushi Burger Bar and on Sunday we went to Marlow's for a Fathers Day meal. I hope all the Dad's had a great day and a special shout out to a couple of single mothers whom I know who fill both of the special roles. You ladies Rock !! 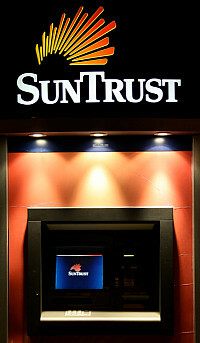 SunTrust Bank is holding a public meeting tonight (Tuesday) Wednesday to discuss their plans to convert the old Hickory House into a new bank. The meeting will be held at 5486 Chamblee Dunwoody Rd, Suite 8 starting at 6 pm to answer any questions the public may have. As a sitting City Councilman I will be there to listen to all sides, as I have always listened to public presentations given to the community. I am told a variance application has been submitted for three variances which will be heard at the August ZBA meeting. 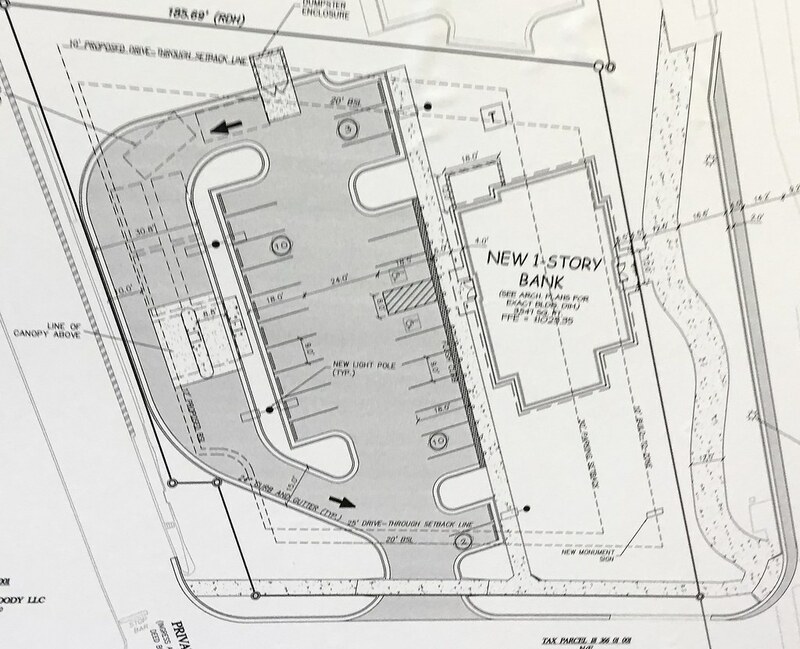 They most likely will apply for two SLUPs related to the overlay requirements and it looks like that will be on the Planning Commission and City Council agendas in September (assuming they meet the July filing deadline). 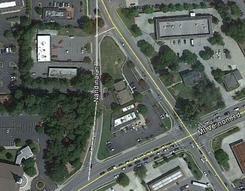 A bank is allowed by right in that commercial zone and the property will not need to be rezoned. I have already received email and some public communication on the subject from here & here but am looking forward to hearing more public comments on Tuesday. Looks like the City of Peachtree Corners is hiring a new City Manager. Scary - DeKalb Public Schools go back August 8th and it is already creeping up on me as I am filling the family calendar for back to school events. For those not at a swim meet or the SunTrust meeting, today is Dunwoody Food Truck Tuesday happening at the Park at Pernoshal Court (4575 North Shallowford Road.). As a big guy who sits too much and sleeps too little, I have added a new exercise routine into my week to burn more calories. As much as I enjoy a bike ride outside, CycleBar the new spinning concept on Ashford Dunwoody is perfect for me and I've already done ten classes and earned ten free rides by completing a challenge. 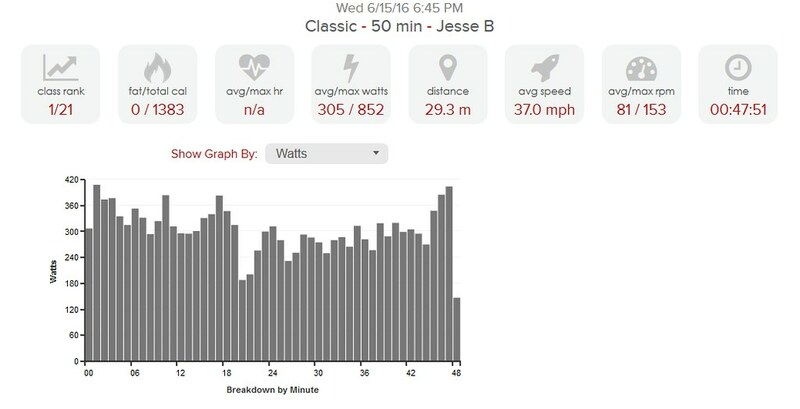 Here is a great review on CycleBar from the Just Peachy Blog and there is currently a Groupon for four classes for just $49.00. There are free classes available on Saturday's. The Crier has an article in the Tuesday edition that I may not be allowed to comment on as per the advice of the City Attorney? That being said, I am told that the Mayor, the City Manager and/or the City Attorney would be happy to discuss the issues raised by any such article should you like further discussion of these issues or clarification. City Hall's phone number is 678-382-6700. 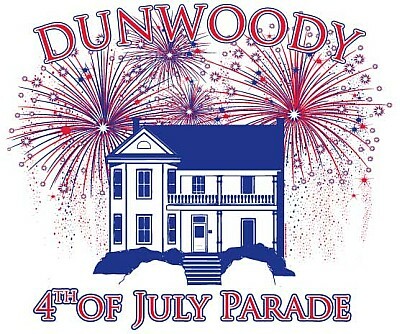 On Monday, July 4, 2016 at 9:00 a.m., the Dunwoody Homeowners Association and the Dunwoody Crier Newspaper will host the annual Fourth of July Parade featuring marching bands, floats, clowns, animal units and local celebrities. Last year the parade attracted over 2,500 participants and 32,000 spectators! This year's theme is Duty Honor & Country. Join the Dunwoody 4th of July Parade on Facebook. Dunwoody Restaurant Week ends Saturday - visit a place you've never been as they are all great. As the father of three active boys with schedules that wildly overlap, I am really looking forward to the coming week as my oldest two go away to Boy Scout Camp on Saturday morning. Just the thought of slowing down to spend some quality one on one time with both my wife Kristin and my youngest Declan makes me giddy. Looking at all of the offerings of Dunwoody Restaurant Week this year, I think I have my menu for Saturday set for the two restaurants that I have never previously visited. Saturday afternoon Declan will be treated to an Ice Cream cookie sandwich at Ali's Cookies and later that evening my bride & I will visit Portico as their special event menu looks fantastic. 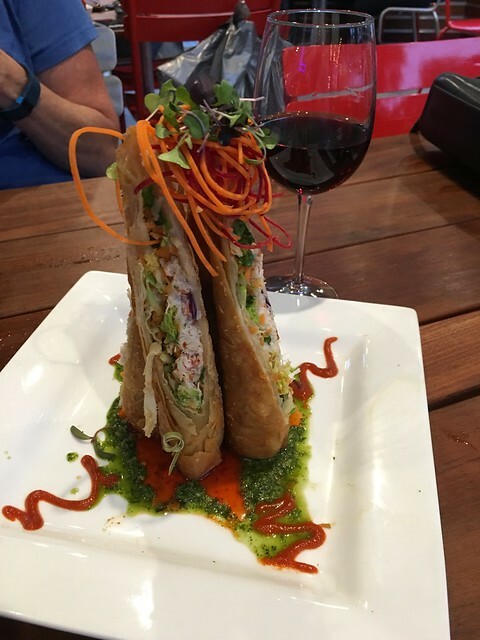 Please check out all of the offerings as there is quite a variety, so review the menus and pick a place you've never been. PS: Saturday will be a nice surprise for Kristin as I know for a fact that she doesn't read my blog. Each summer, Dunwoody, GA, celebrates its annual Restaurant Week, during which visitors can sample food and drink from some of the loved and regarded restaurants in the Atlanta area. 30 participating restaurants plan to showcase their best dishes and desserts with pre-set lunch and dinner menus. Diners are invited to either call to make reservations or simply stop in to enjoy delicious meals for a steal at favorites that include big-name chains, locally owned restaurants and small bistros. 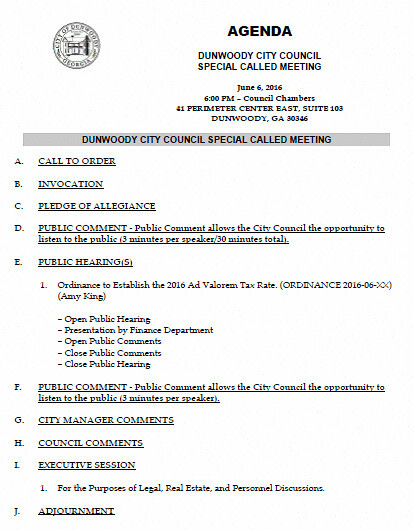 Dunwoody City Council Meeting agenda for Monday June 13 - Tax Rate, new Sidewalks, Bike Strategy & Soccer in a Dunwoody Park. Administer Oath of Office to New Police Officer Joshua Sanders. Presentation of an Award from the Georgia Association of Water Professionals. SECOND READ: ORDINANCE to Establish the 2016 Ad Valorem Tax Rate. Construction Funding Authorization for the Village Creek Drive Sidewalk. Georgia State University & City of Dunwoody Mutual Aid Agreement. RESOLUTION - In Support of the Perimeter Bike Implementation Strategy. Usage Agreement with Chiefs Futbol Club. 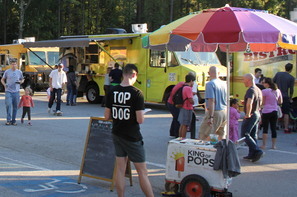 Dunwoody Food Truck Tuesday's at Dunwoody's Pernoshal Park & City Email mailing list. 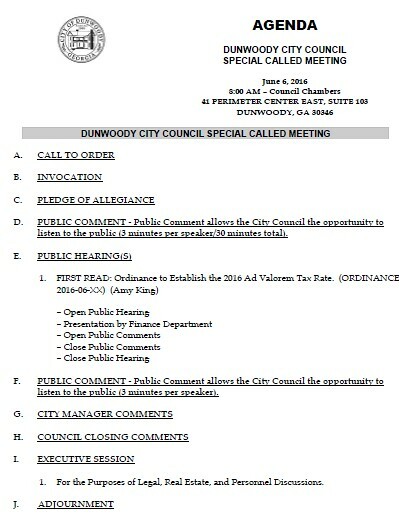 Every Friday the City of Dunwoody sends out a comprehensive email showing items of interest or future events. Below is the email from this week. To register your email to recieve this information, please complete the form found in the link below. 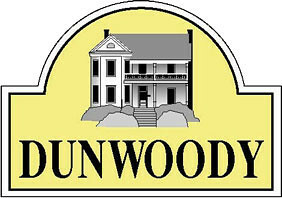 Sign up for City of Dunwoody emails. Join the City of Dunwoody @ the Park at Pernoshal Court for Food Truck Tuesdays! 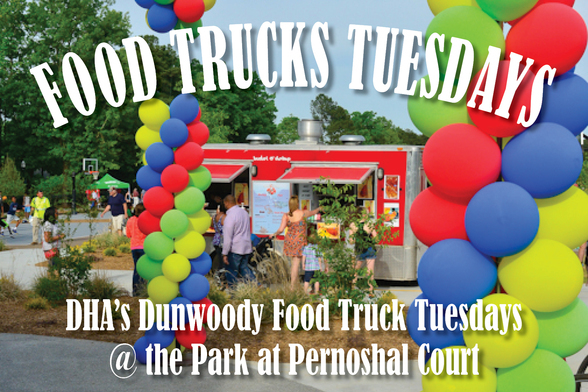 The Dunwoody Home Owners Association and the City of Dunwoody invite you to Food Truck Tuesdays at the Park at Pernoshal Court (4575 North Shallowford Road.) Food Truck Tuesdays will begin June 7th and run every Tuesday for six weeks until Tuesday July 12th. Food Trucks will begin at 6:00 p.m. and end at dusk. For more information visit the city's event calendar! Work crews will conduct road repairs to fix a damaged stormwater culvert at the intersection of Dunwoody Club Drive & Brookeridge Drive. 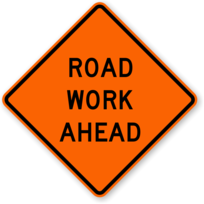 Crews will begin work Friday June 10 (from 9:00 a.m. until 4:00 p.m.) and will continue on Saturday June 11 (from 8:00 a.m. until 5:00 p.m.) and again on Monday June 13 (from 9:00 a.m. until 4:00 p.m.). All construction repair work is dependent on weather conditions. During construction traffic will be reduced to one lane along this section of Dunwoody Club Drive, approximately 150 feet of roadway. Flag crews will assist in directing traffic throughout active construction periods in an attempt to minimize traffic impacts and to ensure the safety of the drivers and the construction crews. Night work not occur on this repair due to the number of residences directly adjacent to the project. 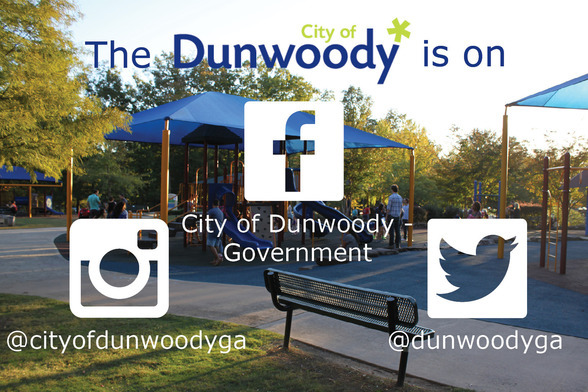 For additional information please contact the City of Dunwoody Department of Public Works at 678.382.6850 or email construction@dunwoodyga.gov. The Mt. Vernon Road - Nandina Lane intersection is undergoing modifications to create a “Right-turn-in/Right-turn-out only” configuration. Once completed, drivers will no longer have the option to make left turns off Mt. Vernon onto Nandina. This change is designed to address safety of drivers as well as pedestrians at this section of road. Left turns in and out of roads, businesses or developments are generally the most problematic movements for drivers. Increased traffic volume over the past five-plus years, coupled with a condensed left turn lane distance approaching the intersection of Mt. Vernon and Chamblee Dunwoody, have raised safety issues for drivers along Mt. Vernon Rd. (both east and westbound). One way to address safety impacts is to eliminate left turns and restrict access to a “Right-turn-in/Right-turn-out only” configuration. Turning restrictions are particularly important when the access points are relatively close to existing intersections, as Nandina Lane is to Chamblee Dunwoody Road. The improvement should also help address safer pedestrian crossings by offering a refuge island at Nandina Lane and reduce points of conflict for crossing pedestrians through the elimination of left turns. 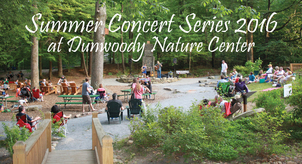 The Dunwoody Nature Center is hosting concerts in the park, sponsored by the City of Dunwoody featuring an all new selection of up and coming bands. This Saturday will feature the band Stonerider. Concerts will be held every other Saturday starting at 7:00 p.m. Bring your chair, blanket, and picnic dinner and cool off with a rotating selection of craft beers hand picked for the night by Moondog Growlers. Seating in the meadow or on the Nature Centers deck is available on a first come, first served basis. Concerts are FREE to members of the Dunwoody Nature Center, $5 for non-member adults, $3 for students, and FREE for children 3 and under. For a full listing of bands visit the Dunwoody Nature Center's event page. Dunwoody Food Truck Thursdays (and Tuesdays!) are here! 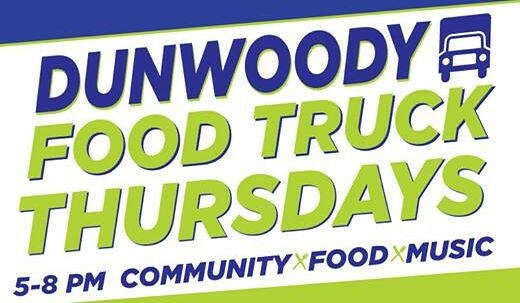 The Dunwoody Homeowners Association's Food Truck Thursdays have begun and are taking place every Thursday at Brook Run Park (4770 N. Peachtree Road, Dunwoody) starting at 5:00 p.m. until dark. Food Truck Thursdays will run all summer and into the fall, ending on October 27th with the annual Truck-or-Treat event. We are looking forward to seeing you there! Coming Next Week! Food Truck Tuesdays at the Park at Pernoshal Court (4575 North Shallowford Road) Beginning June 7th at 6:00 p.m. The City of Dunwoody Municipal Court is holding an Amnesty Program for individuals with past due traffic citations and/or active bench warrants for failing to appear in court. The incentive of the program is to promote lawful driving privileges, settle outstanding violations with the court and reduce arrests. 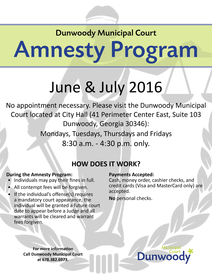 Amnesty will run during the months of June and July 2016 at the Dunwoody Municipal Court located at 41 Perimeter Center East, Suite 103, Dunwoody, Georgia 30346. Individuals may walk-in to the Municipal Court on Mondays, Tuesday, Thursdays or Fridays during the hours of 8:30 a.m. – 4:30 p.m. only, no exceptions. Forms of payment that will be accepted are cash, money order, cashier checks, and credit cards (Visa and MasterCard only.) No Personal Checks. For more information, please contact the City of Dunwoody Municipal Court at 678.382.6973. Join the Dunwoody Nature Center for a taste of camping in the forest, without going too far from home, for their Great Yard Camp out. The camp out will take place Saturday, June 18th at 4:00 p.m. and conclude Sunday, June 19th at 9:00 a.m. At this family focused program, you will learn some of the camping basics like how to set up and break down tents and how to build and put out a campfire. The Nature Center's educators will help you plan for the overnight by explaining everything you need to bring for your adventure. 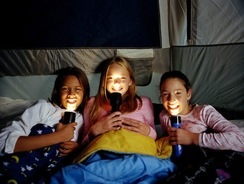 The night will also include s’mores, games, a night hike, and even a camp song or two. Need equipment? Tents, sleeping bags, and other gear is available for rent through our partners at REI Perimeter by calling 770.901.9200 (be sure to ask for Becky! Join your neighbors and B98.5 as they hosts B at the Movies at Brook Run Park, Saturday, June 25th! This FREE annual movie series is presented by McDonald's and EMC Security and takes places in a different Metro Atlanta city every Saturday night from May through August. The Dunwoody event will take place Saturday evening June 25th. 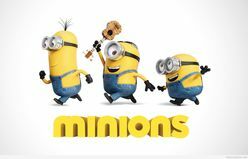 Bring the family, your blanket or beach chair and relax under the stars and enjoy 'Minions' (PG) on a giant 45’ screen. All movies are open to the public and begin at dusk. Trivia Contest: Where in Dunwoody?! Time now for the trivia portion of our City of Dunwoody weekly email news alert. Every Friday from Memorial Day through Labor Day each email news alert will contain a photo trivia challenge. 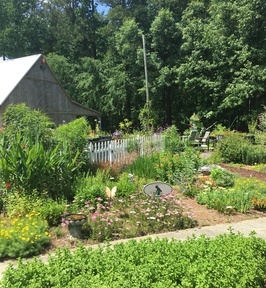 Take a guess where in Dunwoody this picture was taken and you will be entered into the weekly contest and drawing to receive a City of Dunwoody prize. Please email your answer to Bob.Mullen@dunwoodyga.gov. We will contact the contest winner on the following Monday. 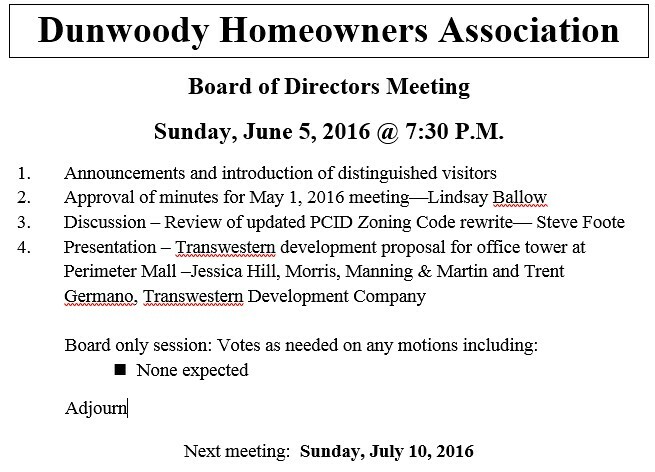 Sunday night Dunwoody Homeowners to discuss zoning code and proposed for new office tower near Mall. 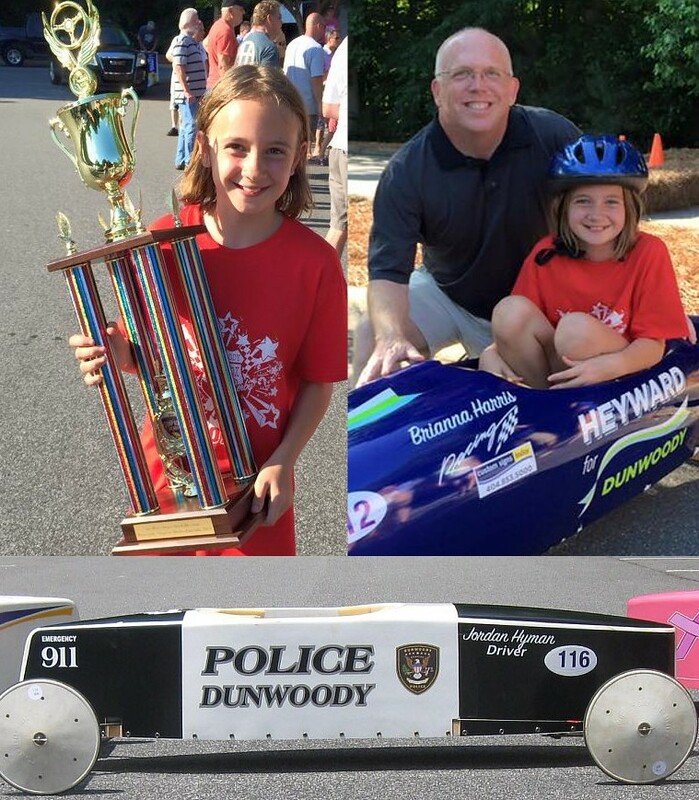 Dunwoody Soap Box Derby today at First Baptist Church Atlanta on North Peachtree Road @ 285. First race kicks off at 8:30 and the last races take place in the late afternoon (est 3 pm). We are excited for another great line up this week at Dunwoody Food Truck Thursdays + music from Ralph Roddenbery! Please come out to dine, relax, listen to some music and let the children play. After dinner, please feel free to stroll our 2 mile trail which is perfect for young bike riders. We can't wait to see you there tonight! Bandora Food Truck - Wheely Grilly in the previous incarnation.